On March 1st, we finally crown a Champion. “Jazzy” J. 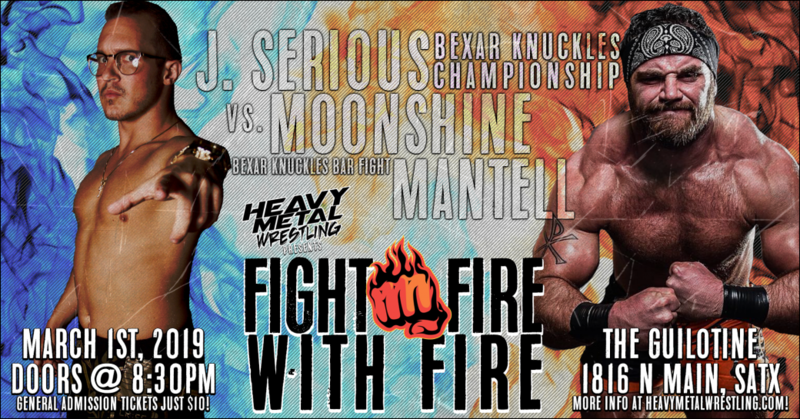 Serious versus “The Son of Texas” Moonshine Mantell for the Bexar Knuckles Championship in a Bexar Knuckles Bar Fight. After a chaotic main event last month that left us with more questions than answers, J. Serious and Moonshine will meet one last time, and this time there MUST be a winner declared. There will be no count outs, no disqualifications and no time limit. Pinfalls can be counted from anywhere inside of The Guillotine. On March 1st, there WILL be a Champion crowned and we will find out just who the better man is. Do not miss your opportunity to see two of Texas’ best square off with #HeavyMetalWrestling’s grandest prize hanging in the balance. What a main event this is going to be.